I've also owned quite a few Cthulhu tanks: the original RTA, Hastur. I was quite a fan of the MTL, I had two, but it had a few quirks. I was interested to see if they had improved on it. It is a 24mm tank, in the 'GTA' style - the chamber being mid way up, and the wicks hanging down into the bottom of the tank. The deck is arranged in two crescent shaped blocks, one positive, one negative. Each block has two post holes which are side entry types, but with an interesting shape to the slots which prevents the legs of your coils escaping from under the grub screw. The screws are for a flat ended screw driver (supplied) - not silky smooth, but tough enough. The tank is top fill, the cap has a bayonet style fitting which works. I think this is an attempt to avoid the pressure build up that occurred with the previous design. There is a crudely chamfered 'nut' on the top cap. This make removal and replacement easy. 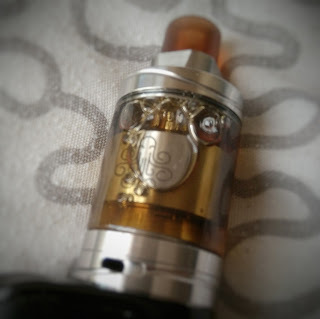 However, the stubby drip tip means that your lips will on occasion make contact with it - it isn't sharp, just uncomfortable. The deck is easy to use - coils fall naturally at the correct height, with no bending of the legs. The deck comes with reducing inserts like the original Cthulhu MTL - supplied diameters are 1, 1.6, 2, 2.5 and 3.5mm - with extras inserts to be supplied soon, including dual holes. The size of the positive and negative blocks make for a remarkably small chamber. 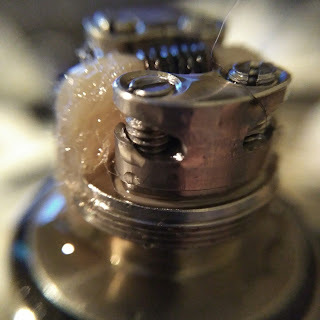 2.5mm coils fit naturally, with some trimming or combing of the wick tails to fit through the holes. The deck cannot be removed from the tank while full. This is a quite a design flaw in my opinion. The glass section is kept in place by compression as you screw the chimney onto the deck section. So if your build, or more likely wick, needs attention, you might have to resort to a bit of electrical tape around the top. Despite the odd quirk (deck removal, strange top nut) the vape from this tank is great. Nice smooth airflow, saturated vapour. The small effective chamber size makes it really efficient, I found myself running a 27g, 1ohm build at only 10 watts. The 1mm insert is a proper MTL, 1.6mm is slightly more open, but you'd struggle to do a lung hit. 2mm is right on the cusp, you can take a MTL hit, or a restricted lung hit, above this is all DTL, but it feels like you would be fighting wick, chamber, coil size to deliver enough vapour without dry hits or heat build up - it is doable though. You need to take care with the amount of cotton in the holes, as it swells it can choke. I haven't had a single leak or gurgle from it. 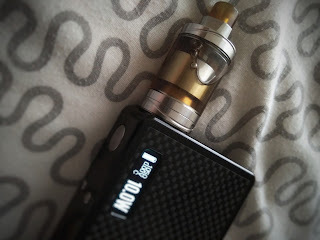 Definitely an improvement on the previous incarnation, but a different atomiser in reality rather than an evolution.